Your vehicle is designed primarily as a passenger carrying vehicle. Towing a trailer will have an adverse effect on handling, performance, braking, durability, and fuel consumption. For your safety and the safety of others, do not overload the vehicle or trailer. To tow a trailer safely, use extreme care and drive the vehicle in accordance with the trailer’s characteristics and operating conditions. The vehicle stability and braking performance are affected by trailer stability, brake setting and performance, and the hitch. Toyota warranties do not apply to damage or malfunction caused by towing a trailer for commercial purposes. Contact your Toyota dealer for further information about additional requirements such as a towing kits, etc. Confirm that the gross trailer weight, gross vehicle weight, gross axle weight and trailer tongue load are all within the limits. ● The gross trailer weight must never exceed 700 lb. (315 kg). ● The gross vehicle weight must never exceed the GVWR indicated the Certification Label. ● The gross axle weight on each axle must never exceed the GAWR indicated the Certification Label. 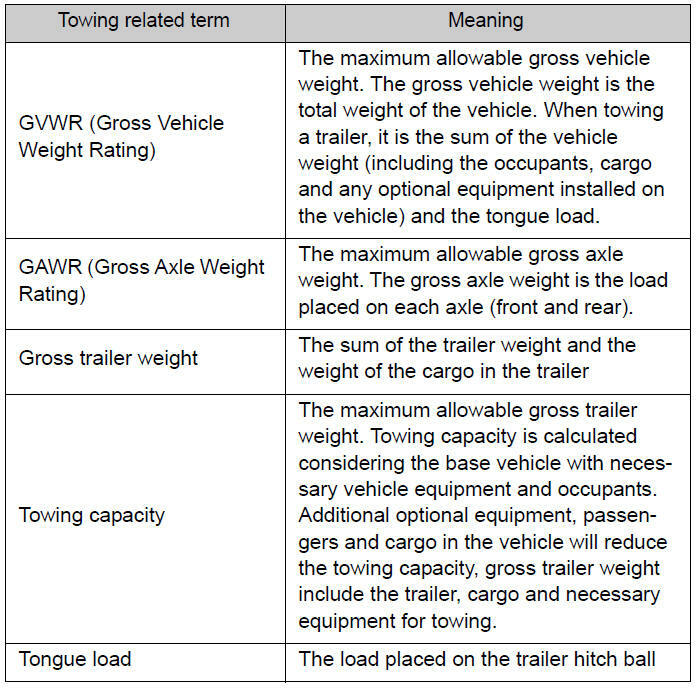 ● A recommended tongue load varies in accordance with the types of trailers or towing as described below. ● In order to ensure the recommended values shown below, the trailer must be loaded by referring to the following instructions. The trailer cargo load should be distributed so that the tongue load is 9 to 11% of the gross trailer weight, not exceeding 70 lb. (31 kg). The gross trailer weight and tongue load can be measured with platform scales found at a highway weighing station, building supply company, trucking company, junk yard, etc. Trailer hitch assemblies have different weight capacities established by the hitch manufacturer. Even though the vehicle may be rated for towing a higher weight, the operator must never exceed the maximum weight rating specified for the trailer hitch. ● Before starting out, check the trailer lights and the vehicle-trailer connections. Recheck after driving a short distance. ● Practice turning, stopping and reversing with the trailer attached in an area away from traffic until you become accustomed to the feel of the vehicle. ● Reversing with a trailer attached is difficult and requires practice. Grip the bottom of the steering wheel and move your hand to the left to move the trailer to the left. Move your hand to the right to move the trailer to the right. (This is generally opposite to reversing without a trailer attached.) Avoid sharp or prolonged turning. Have someone guide you when reversing to reduce the risk of an accident. ● Avoid sudden braking as you may skid, resulting in jackknifing and loss of control. This is especially true on wet or slippery surfaces. ● Avoid jerky starts or sudden acceleration. Vehicles with a manual transmission, prevent excessive clutch slippage by keeping engine rpm low and not racing the engine. Always start out in first gear. ● Avoid jerky steering and sharp turns, and slow down before making turn. ● Note that when making a turn, the trailer wheels will be closer than the vehicle wheels to the inside of the turn. Compensate by making a larger than normal turning radius. ● Crosswinds and rough roads will adversely affect handling of your vehicle and trailer, causing sway. Periodically check the rear to prepare for being passed by large trucks or buses, which may cause your vehicle and trailer to sway. If swaying occurs, firmly grip the steering wheel, reduce speed immediately but gradually, and steer straight ahead. Never increase speed. If you make no extreme correction with the steering or brakes, your vehicle and trailer will stabilize. ● To maintain engine braking efficiency and charging system performance when using engine braking, do not use the transmission in D (vehicles with an automatic transmission) or 5 (vehicles with a manual transmission). Have someone place wheel blocks under both the vehicle and trailer wheels. Shift into P (vehicles with an automatic transmission) or 1 or R (vehicles with a manual transmission) and turn off the engine. With the transmission in P (vehicles with an automatic transmission) or the clutch pedal (vehicles with a manual transmission) depressed, start the engine. On vehicles with an automatic transmission, be sure to keep the brake pedal pressed. Release the parking brake (also brake pedal on vehicles with an automatic transmission), and slowly pull or back away from the wheel blocks. Stop and apply the brakes. ●Trailer tires should be inflated according to the trailer manufacturer’s recommendation. ●The rear view mirrors conform to any federal, state/provincial or local regulations. If they do not, install rear view mirrors appropriate for towing purposes. If your vehicle is new or equipped with any new power train components (such as an engine, transmission, differential and wheel bearing), Toyota recommends that you do not tow a trailer until it has been driven for over 500 miles (800 km). However, avoid full throttle acceleration. ●Retighten the fixing bolts of the towing ball and bracket after approximately 600 miles (1000 km) of trailer towing. ●Follow all the instructions described in this section. Failure to do so could cause an accident resulting in death or serious injury. ●Exceeding the towing capacity, GVWR or GAWR can cause an accident resulting in death or serious personal injuries. ●Do not exceed 45 mph (72 km/h) or the posted towing speed limit, whichever is lower. As instability (swaying) of the towing vehicle-trailer combination increases as speed increases, exceeding 45 mph (72 km/h) may cause loss of control. ●Do not exceed the trailer hitch assembly weight, gross vehicle weight, gross axle weight and trailer tongue load capacities. ●Never load more weight in the back than in the front of the trailer. About 60% of the load should be in the front half of the trailer, and the remaining 40% in the rear. ●Do not use cruise control when you are towing. ●Avoid holding the brake pedal down too long or applying the brakes too frequently. This could cause the brakes to overheat and result in reduced braking efficiency. ●Do not tow the vehicle with the compact spare tire installed. ●If you wish to install a trailer hitch, contact your Toyota dealer. ●Use only a hitch that conforms to the gross trailer weight requirement. ●The towing capacity of 700 lb. (315 kg) can only be guaranteed when using a genuine Toyota hitch assembly or equivalent. ●Follow the directions supplied by the hitch manufacturer. ●Lubricate the hitch ball with a light coat of grease. ●Remove the trailer hitch whenever you are not towing a trailer. After removing the hitch, seal any mounting hole in the vehicle body to prevent entry of any substances into the vehicle. ●Use only the position recommended by your Toyota dealer. Do not install the trailer hitch on the bumper; this may cause body damage. ●Do not use axle-mounted hitches, as they can cause damage to the axle housing, wheel bearings, wheels or tires. A safety chain must always be used between the towing vehicle and the trailer. Leave sufficient slack in the chain for turns. The chain should cross under the trailer tongue to prevent the tongue from dropping to the ground in the case that it becomes damaged or separated. For the correct safety chain installation procedure, ask your Toyota dealer. Directly splicing trailer lights may damage your vehicle’s electrical system and cause a malfunction.